Are You Still Teaching Taxonomy? If you are using an older biology book, chances are, the chapters are organized by kingdoms, phyla, and then orders. The textbook we currently use with the freshman class is organized in this way, students move from chapters on invertebrates like nematodes, sponges, mollusks, and annelids to the vertebrates, where each group is packaged into its own chapter. Within those chapters, students might be asked to learn subgroups. For example, the chapter on reptile organizes them into turtles and tortoises, snakes and lizards. Since its publication, scientists have added groups, changed names, and reevaluated animals that are in each group. At some point, hyenas went from being canid to being in the felis group, and given the subfamily name: Hyaeninae. Superfamilies and suborders have also been added, and my 2006 textbook has become woefully out of date. It is also questionable how much of this grouping and Latin naming is necessary for a basic biology class. In fact, the Next Generation Science Standards do not mention taxonomy at all, though one could infer some taxonomy may be necessary to fully understand evolution. The standard listed below refers to species. To understand speciation, you do need to define a species, and that might also include an analysis of how organisms are named and grouped. HS-LS4-5 Evaluate the evidence supporting claims that changes in environmental conditions may result in: (1) increases in the number of individuals of some species, (2) the emergence of new species over time, and (3) the extinction of other species. The biggest change has occurred in the Protist group, which in the older textbook is called a Kingdom. Protists are no longer classified in this way, and in fact, all eukaryotes have been re-organized. The new classification system is quite complex and there are many areas that are still under discussion. The chart below shows the five supergroups and samples of organisms found in each. The animal, plant, and fungi kingdom are still represented, under the Supergroups. 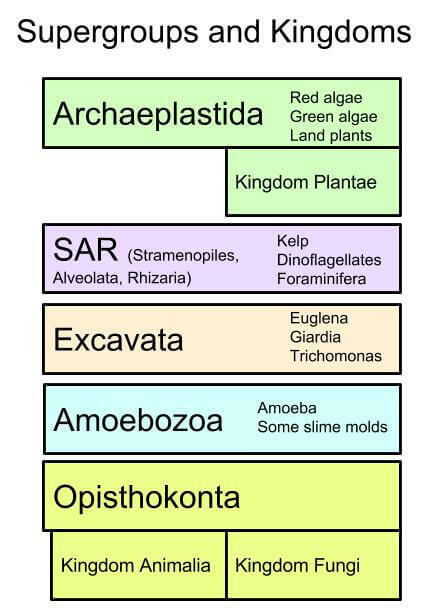 SAR, Excavata, and Amoebozoa contain many of the familiar microorganisms that were associated with the now defunct kingdom protista. As you can see, the complexities of taxonomy, particularly regarding protists may make it nearly impossible to cover in a basic biology course. There just isn’t enough time for that. Many of us have probably already pruned the content from the biology curriculum based on NGSS, but feel we can’t just ignore the microorganisms that were once a staple in biology. I no longer cover the “Kindgom Protista” in my class, but I do include samples of eukaryotic organisms for viewing under slides; my students love to watch the amoeba! It can still be relevant in lessons that compare prokaryotes to eukaryotes and lessons on evolution and the history of life on earth. I find that my sophomore biology students have very little sense of the variety of living things. I am looking at doing some kind of cursory taxonomy unit simply to introduce my students to the living world. I would like my students to recognize a tree or two, a bird or two, and a forb or two from their home environments. For all of the cells, biomolecules, and genetics that are part of biology and standardized tests, my students have little idea that those topics and processes are part of a wonderful living world all around them. I would like them to notice the wonder of our wonderful world.